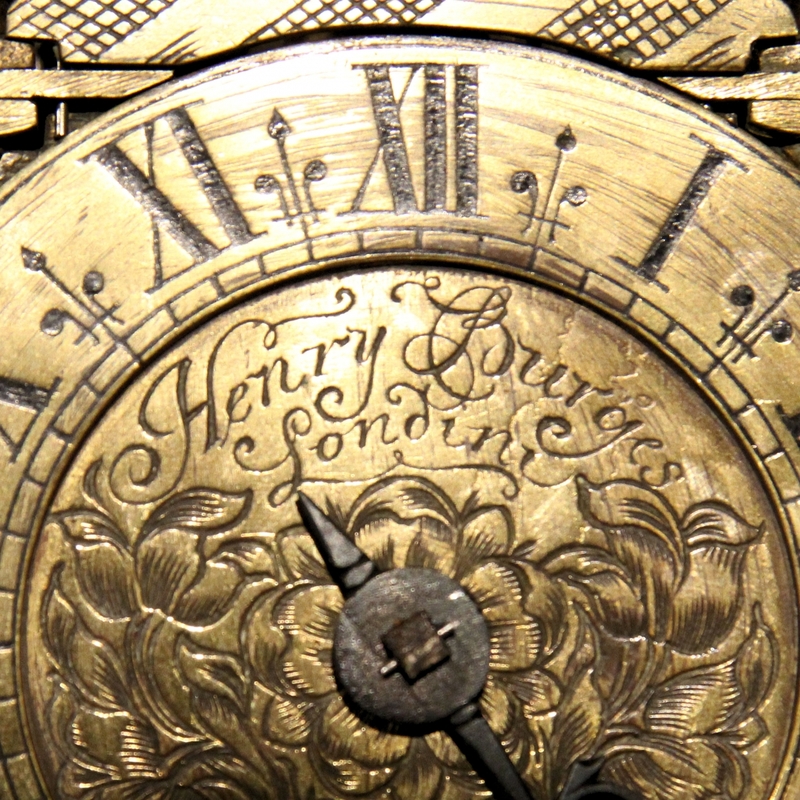 Miniature striking English lantern clock by Henry Burges, London. Circa early 18th century. who buys clocks, how do I sell my clock, clock buyers. Early English dial clock with transitional features. Made by Massey of London. Circa 1810. English fusee dial wall clock retailed by camerer Cuss, London. Circa 1890. Small english dial wall clock by H.Williamson Ltd. Coventry. Circa early 1900's. Small and 'untouched' english dial, fusee wall clock with an 8 inch dial and mahogany case. Circa early 1900's. 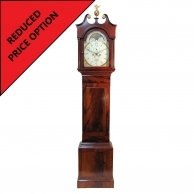 Striking, double fusee, English drop-dial wall clock in a mahogany case. Circa 1840. English Fusee, 5-glass, striking Library clock in a mahogany case by Merrick, Windsor & Eton. Circa 1845. 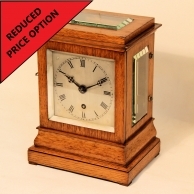 English Fusee 5-glass Library clock in a small, light oak case. Circa 1850. Georgian 'Balloon' table clock in an ebonised case. Circa 1790. French Portico, four pillar mantel clock in ormolu and cut crystal case. Circa 1830. Very small French mantel clock in a white marble and ormolu balloon shaped case. Circa 1900. 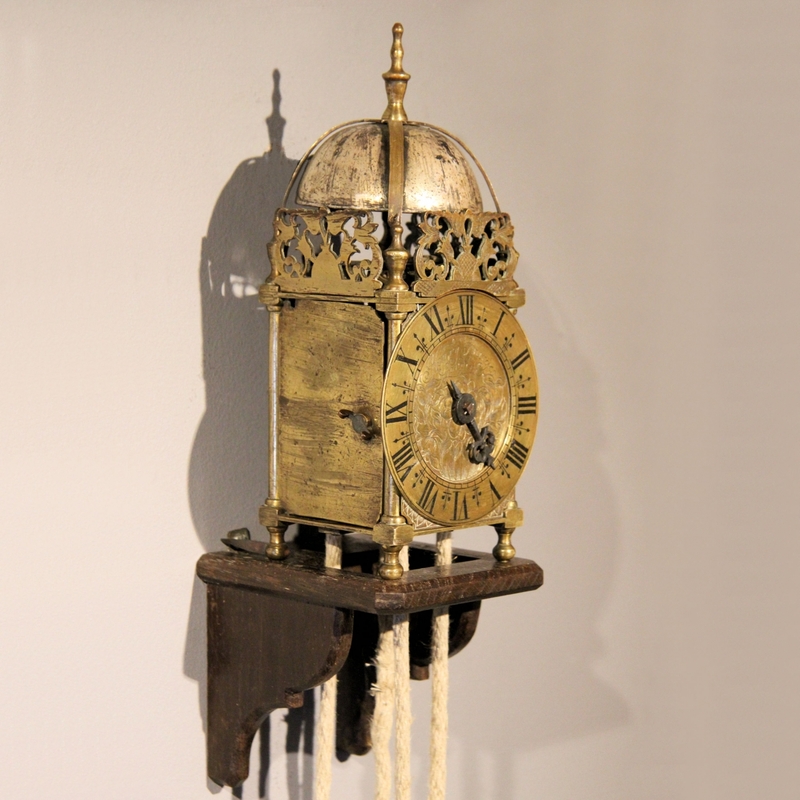 Winged Lantern clock with original Verge escapement. Maker, John Wright, Mansfield. Circa 1690. 17th century and later, English Lantern clock with double fusee movement. Originally Circa 1690. Converted English Lantern clock originally circa 1670. Maker: John Harris of London. Small striking Lantern clock. English Circa 1690 (third period). Miniature silver carriage clock in an engine turned case. Hallmarked 1899. Drocourt, small striking French Carriage clock in a gorge case. Circa 1870. French repeating carriage clock in a corniche styled case. Circa 1880. Sub-miniature antique french carriage clock. Circa 1900. Good repeating French carriage clock in an early one piece case by Drocourt. Rocking ship automata longcase clock by Bugden of Sodbury. Circa 1815. Mahogany moonphase, eight day longcase clock by John Warry of Bristol. Circa 1815. 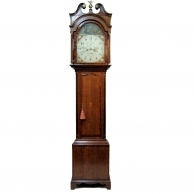 Attractive pale mahogany longcase clock by William Avenell of Farnham. Circa 1805. Automata dial, mahogany longcase clock by John Morse, Southampton. Circa 1790. Longcase clock domestic regulator. Mahogany case. Circa 1850. Rare and Early 'Sheraton' banjo barometer of the first period by Walter Gough, London. Circa 1785. Georgian mahogany mercurial 'four dial' banjo barometer with unusual veneer. A good Georgian banjo barometer by George Dollond of London for sale. C.1830. Small 'Stable' or 'Turret' clock movement, weights, pendulum and keys. Victorian Glass dome & base. Antique watchmaker's 'Topping' tool for sale. Circa late 19th century. 8mm watchmaker's lathe for sale. German, circa early 20th century. Carriage Clocks; Their History and Development. 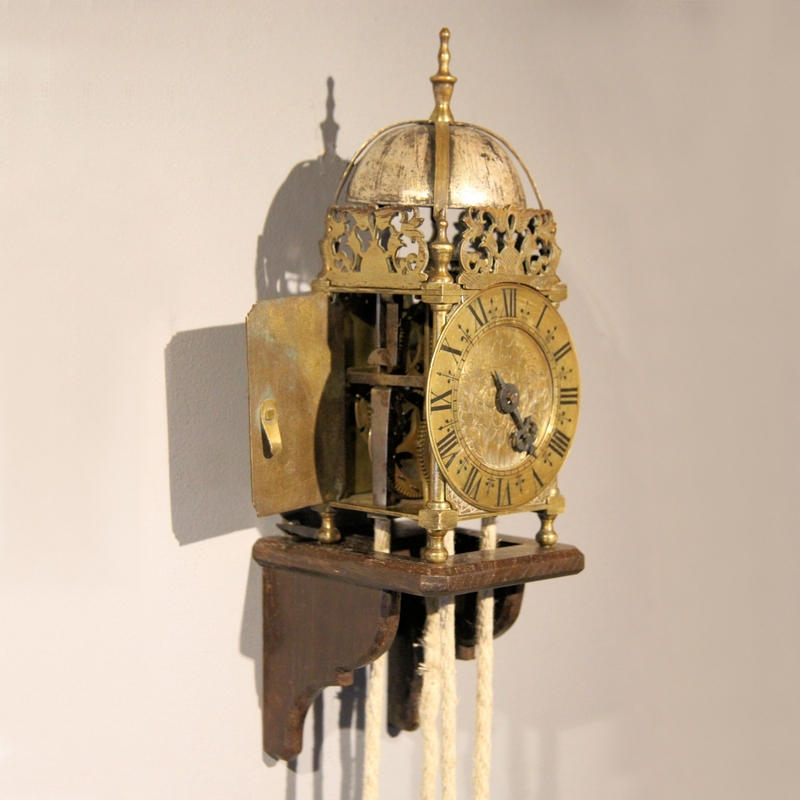 The Story of the Pendulum Clock. English Bracket and Mantel Clocks. 013 A small and good, Gentleman's Rosewood Library timepiece. 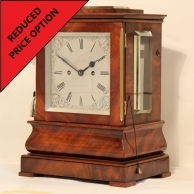 008 A very fine, engraved Gorge style, bell striking and repeating carriage clock with alarum by Henry Lepaute. circa 1870.
Who is Mark Taylor and what does he do? Are You Undecided About A Clock? 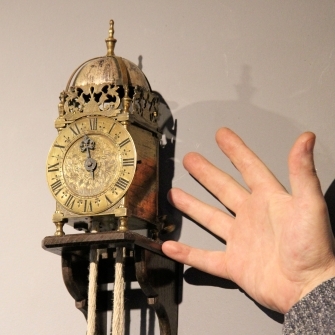 A rare striking chamber clock that can only be described as "Tiny". The weight driven 'Huygens endless cord' method movement with short pendulum verge escapement and striking the hours on the top mounted, crisp sounding bell. Mostly original, this clock is robustly made with cast doors and three thick, low, tulip pattern frets the front of which being engraved. Now mounted upon a well made and attractive oak wall bracket but still retaining its hoop and spikes for the traditional method of hanging. With a chapter ring of only 3 3/4" in diameter, the dial plate has a tulip design engraved centre with an open upper area bearing the maker's name "Henry Burges (of) Londini" in flowing script. 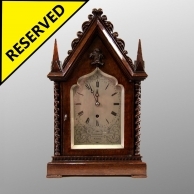 * Henry Burges seems an elusive maker, there are other clocks of this period signed with the same name but this is the only one bearing a place name. He was obviously talented because a clock of this quality and size with a striking train is very rare. This is the smallest striking English antique lantern clock that I have ever seen. Dimensions: Frame 3 1/16" x 3 1/16" by 8 3/4" high including finial! Condition: Excellent and of good colour, patination and originality. Circa: Early 18th century (c.1700 - 1710). Library mantel clock for sale. In a small Gothic 'Steeple' style oak case with a chain fusee movement by John Frodsham, London. Circa 1830.